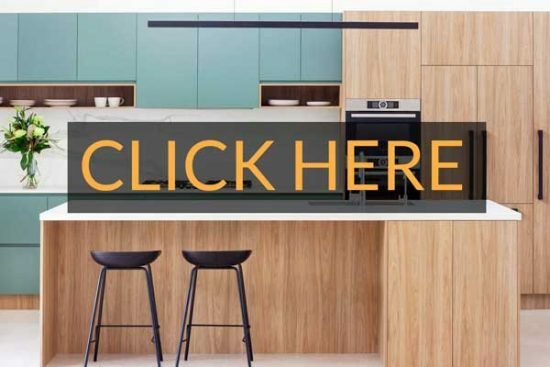 Kitchen design trends change frequently and as new products become available, often the industry standard kitchen cabinet sizes have to be adapted to suit. 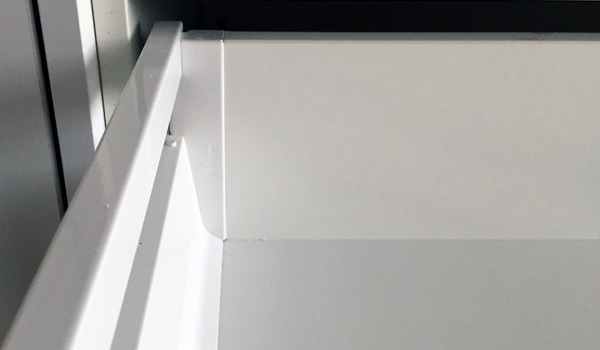 The industry standard kitchen cabinet depth is 600mm (from front to back) however this is often too tight to accommodate certain kitchen fittings. At Premier Kitchens we have increased our cabinet depth by 50mm to allow for modern day sinks and tapware that require more room. 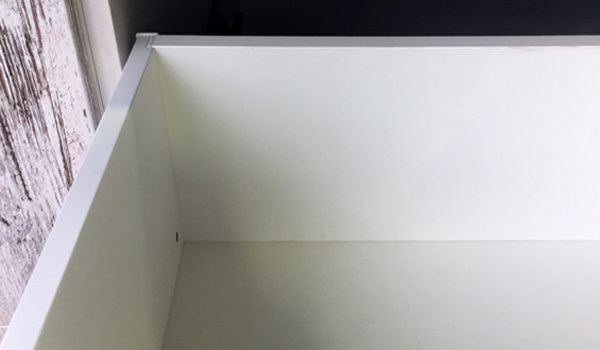 Instead of bringing the cabinetry off the wall and leaving a non-usable 50mm void at the back like other kitchen companies, we increase your overall cabinet depth for greater storage capacity and to make your kitchen more practical & easy to use. Increasing our kitchen cabinet sizes has helped us stay in tune with the modern fridge designs we come across on a daily basis, that are now made deeper. You get 50mm more storage depth in all of your kitchen cabinets at Premier Kitchens (no extra cost). Increasing the base units also means an increase in full height cabinetry depth (e.g pantry) and overheads. With our overhead cabinets set to 400mm deep (as opposed to the industry standard of 280-340mm), this means you can now fit larger plates, platters and items that don’t get used very often in your overhead cabinets. Where before you would be forced to store these items in the deeper cabinets below, now you can choose where you would like to store them based on preference, not necessity. Our cabinet height is 2330mm (which is the tallest height that a fully assembled cabinet can be stood up beneath a 2400mm high ceiling) as opposed to the shorter, industry standard cabinets that usually get filled in with Bulkheads. We also offer cabinetry up to a maximum height of 3000mm for homes with 3300-3600mm high ceilings instead of the industry standard 2400mm high offered by most other modular or custom kitchen joinery. Our standard drawer runners are the very latest in both design and function from Blum, called ‘Legrabox’, which is their top of the range drawer system. The runners are bottom mounted and routed into the drawer itself, which offers greater storage and better alignment as the drawer mechanism is always in complete contact when opening. Because the mechanism is bottom mounted it also means that the drawer sides can be thinner (12mm) and squared off on the bottom; once again offering greater storage and preventing items such as cutlery trays from moving around when opening. Our standard Blum Legrabox drawer runners come in Silk White to match your cabinetry internals, but we offer the optional upgrade of Orion Grey with Grey internals if you prefer. Fridges = We’re often asked, “what’s a standard fridge size?” and the short answer is, there isn’t one. Fridges these days come in all different shapes and sizes, it all depends on the brand/model. Each model also has its own ventilation space requirements for the top, back and sides of the fridge, according to their warranty terms. If your new cabinetry fails to comply with the manufacturers’ ventilations requirements, it may void the warranty should something go wrong with the unit. Not such a big deal with older fridges that are already out of warranty, but at this point, if you do have an old fridge and are considering to upgrade, it’s best to buy a new one before the new kitchen goes in so that you can be sure it will fit and the cabinetry can be built to suit the new one. Dishwashers = Usually a standard 600mm wide space for integrated models and 605mm for freestanding models. Ovens & Cooktops = Industry standard is 600mm wide, however ovens & cooktops are available in wider sizes also, depending on the brand (700mm-900mm approx). Benchtop Height = Industry standard is 900mm high. Taller people may feel more comfortable raising this up to 920 or 940mm high. Splashback height = Industry standard is 600mm high for electric cooktops and 700mm for gas (fire safety requirement). Maximum cabinet/drawer width = Max width is 1200mm. For drawers, we find this can sometimes be a little too wide. It can affect the usability in smaller kitchens and depending what is stored inside, can get quite heavy. Washing machine space = Usually a standard width of 650mm will fit most washing machines (depth will can vary depending on the make & model). The measurements listed above are to be used as a guide only and may vary depending on your individual kitchen design.